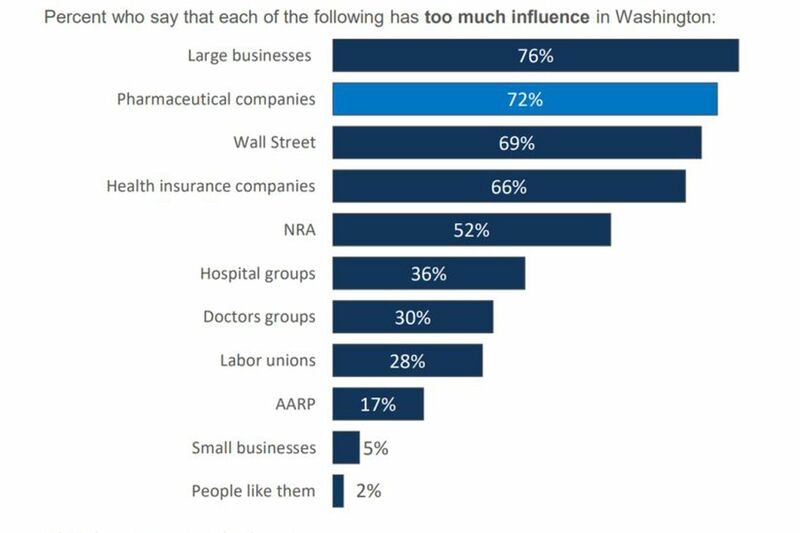 Pharmaceutical companies top the list of industries that Americans say have too much political clout. The recent school shootings in Florida and Maryland have focused attention on the National Rifle Association's clout in state and federal lobbying activities. Yet more than the NRA or even Wall Street, it's the pharmaceutical industry that Americans think has the most muscle when it comes to policymaking. Drug prices are among the few areas of health policy where Americans seem to find consensus. Eighty percent of people said they think drug prices are too high, and both Democrats (65 percent) and Republicans (74 percent) agreed the industry has too much sway over lawmakers. Democrats were far more likely than Republicans — 73 vs. 21 percent — to say the NRA had too much influence. The monthly poll also looked at views about health care. Americans may be warming to the idea of a national health plan, such as the Medicare-for-all idea advocated by Sen. Bernie Sanders (I-Vt.). Overall, 59 percent said they supported it, and even more, 75 percent, said they would support it if it were one option among an array for Americans to choose. Americans are far more concerned with lowering prescription drug prices, though they don't trust the current administration to fix the problem. Fifty-two percent said lowering drug costs should be the top priority for President Donald Trump and Congress, but only 39 percent said they were confident that a solution would be delivered. "There's more action happening on the state level; what we are finding is they're not seeing the same action on the federal level," said Ashley Kirzinger, a senior survey analyst for KFF's public opinion and survey research team. "They're holding the president accountable as well as leaders of their own party." Overall, at least three-quarters of people don't think Democrats and Republicans in Congress, as well as the Trump administration, are doing enough to bring costs down. Twenty-one percent reported that they didn't trust either party to lower prices, up from 12 percent in 2016. And, unlike other health-related policy questions such as repealing the Affordable Care Act or creating a national health plan, the poll does not find a partisan divide on this perception. Passing legislation to lower drug prices was at the top of the list of the public's priorities, making it more important than infrastructure, solving the opioid epidemic, immigration reform, repealing the ACA or building a border wall. Looking ahead to the 2018 midterm elections, 7 percent reported that creating a national health plan was the "single most important factor" for how they would vote in 2018. However, 7 in 10 said it is an important consideration, and 22 percent said it is not an important factor at all. The poll found that support for the federal health law fell this month, from February's all-time high of 54 percent to 50 percent in March. Opposition moved up slightly from 42 to 43 percent. The poll was conducted March 8-13 among 1,212 adults. The margin of sampling error is +/-3 percentage points.